Five-year-old Hunter Johnson colors the pictures on the page to show which things he can do with his dad. Then he circles all the things he still can do after his dad deploys. It’s just one of the activities in his deployment activity book that helps him better understand his dad’s military deployment and its effect on his own daily life. Hunter received the book at a Yellow Ribbon Program (YRP) pre-deployment briefing he attended with his family. 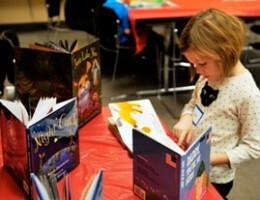 Since the inception of the program in 2008, books have been a vital part of supporting military families before, during, and after deployment. Resources used in this Department of Defense initiative cover a wide range of topics, including marriage enrichment, financial management, family benefits, leadership strategies, communication techniques, and spiritual wellness. A girl whose parent is deploying with the National Guard reads at the 850th Engineer Company Family Preparation Academy in Minnesota. Photo courtesy of Beyond the Yellow Ribbon. Children also attend the two-day event. When they arrive, the young kids carry with them confusion and anxiety. When they leave, they have a better understanding of how many others share their challenges, and, like their parents, they carry with them a book to help them through the deployment. Nothing feels quite as comforting as being handed a fun activity book created just for them. 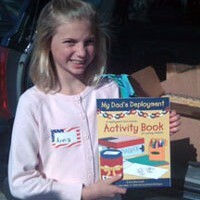 The book Hunter received was My Dad’s Deployment: A deployment and reunion activity book for young children. Children who had a mom deploying received My Mom’s Deployment, the mom version of the 112-page activity book. 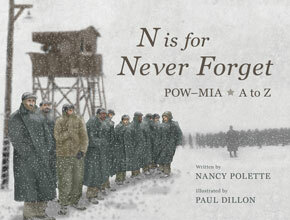 Marine wife Julie LaBelle wrote the activities for the books. Tapping into her experiences as a military wife, preschool teacher, and mother of three children who struggled with their father’s deployment, Julie created the books to help facilitate communication between parents and young children and to help children better understand their situation. 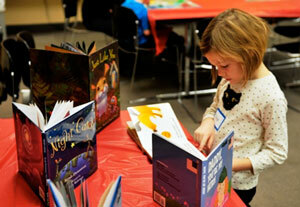 “I wish there had been books like this when my kids were little,” Julie says. While her husband was deployed, she watched her children freeze up on the phone when they had precious minutes to talk with their dad. She realized they could have practiced the calls and they would have been more prepared to better connect with him on the phone. Julie wanted something that would help military families with those daily challenges of deployment. Through guided exercises, the activity books encourage regular connection between the parent at home and the child during deployment and foster communication between the child and service member before and after the deployment. “There is learning on both ends…for the parent and the child, and then they share with the deploying parent before they leave and when they return,” Julie says. The fun activities in the book, such as deployment-related mazes, matching, coloring, and crafts, give young children a safe way to ask questions, talk about feelings, and feel connected to their parents. Implementation of Yellow Ribbon Programs varies slightly within each branch of service, as well as from state to state, but the intent is the same. Families and service members are offered support and resources to help them from preparing for deployment through three months into reunion. By including the youngest members of the families, the depth of support increases. For families with children, the stressors of deployment can be significantly complicated. More than two million American children have experienced a parent’s deployment, 78% of them under age 11 (National Military Family Association, 2010). For much of the history of the military, the focus has been on the preparation and resources available to service members, but the needs of the family members, and specifically the children, were not being met. 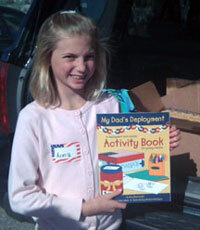 Books such as the deployment activity books are provided at no cost to children who attend the program. “The children really enjoy getting the books,” Peloquin says, “They are wonderful tools, and the kids get to take them home with them and go through them on their own time.” And for kids like Hunter, that can make all the difference. 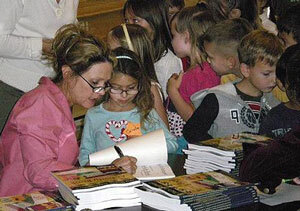 Feature photo: Author Julie LaBelle signs copies of her activity books for kindergarten students at Mary Fay Pendleton School. 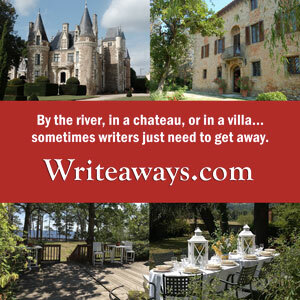 The activity books mentioned in this article are also available through your favorite online and retail bookstores.